Cats will have some hopping fun with the Look Who's Talking Cat Toy Frog! Looking for a pet toy that talks back to your vocal cat? This cute little plush frog is going to have your kitty playing for hours with its motion-activated sound chip that "ribbits." The realistic animal sounds will definitely catch your kitty's attention. 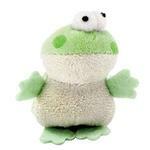 This fun frog features plush materials with felt appendages that make it easy for your cat to carry around. They will love batting at it and watching the frog skitter across the floor. The small size makes this plush toy fun for cats of all sizes. Watch out, or your little dog might try to steal this pet toy for themselves! Fortunately, this is a durable cat toy, so even if your canine should borrow it, it should be fine. Great for fetching. Frog is cute and soft making ribbit noises all the way back. Checking this site is always fun! We love the merchandise, prices are great, love the sales,fast shipping and Baxter's Backyard! Another dimension is the kindness and genuine love of animals shown by Baxter's humans ( helping the Sochi dogs & pet parenting ). WAY TO GO, BAXTER BOO !! !